Question: I love my thin stick, but in the reading I’ve done, I’ve not been able to establish if they are faster than a fat blade. Do the Greenlanders use them only because they enjoy them or because they are faster as well? They are so delightful to use and easy to make I can’t understand why more people don’t use them. Thanks for any help you can give. Answer: The speed of a kayaker has to do with many factors; including the kayak itself, but mainly, the technique of the person paddling it. The three main types of paddles are traditional paddles (Greenland sticks), European paddles (the Euro blade) and wing paddles. It is believed by many that of the three types, the wing blade is the fastest. Of the other two… it depends who you ask. I believe that it comes down to technique. When I was in Greenland I only saw Greenland paddles. The purpose of the Greenland National Kayaking Championship is to preserve the traditions of the Greenlandic culture, and therefore, only traditional gear is used. However, the Greenland paddle is a remarkable tool, and so my thought falls to the common saying, “If it isn’t broken, don’t fix it.” This might be part of the reason that the European blade hasn’t become popular in Greenland. As you said yourself, “they are so delightful to use and easy to make.” I have found that my Greenland paddles works well in everything I paddle in, from flat water to surf, and I don’t use any other kind of paddle. Hope this helps. After four flights and 20 something hours I arrived in Catania, Italy. Francesco Petralia (the organizer of the event), Justine Curvengen, Barry Shaw and Gianfranco Liotta (another organizer) met me at the airport. I hadn’t slept in a long time and was exhausted. With some cam straps and a little creativity, we all piled into the car with bags filling the trunk, surrounding us and tied to the roof. Then we took off for Paola’s (Francesco’s mother) house. The town was everything I’d heard about Italy but not really expected… small bakeries, gelato stands, very old houses with verandas and olive trees. I was greeted by Paola who kissed both of my cheeks. We stepped out onto the veranda and food began appearing on the table. Olives that were grown by Paola, fresh bread, two kinds of cheeses, a bar of salami, eggplant, pasta and homemade wine. I hadn’t realized how hungry I was and began to consume the spread while I listened to Paola talk about the process for preparing olives. After the wonderful food and friendly conversation we drove for two hours and got on a ferry for the island of Volcano. 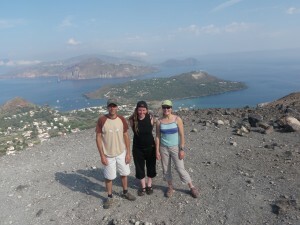 The island is a volcano, as are all of the Aeolian Islands, and after the 1 hour 50 minute ferry ride, the beautiful island came into view through the darkness of the night. We drove from the ferry to a charming hotel, becoming a little overwhelmed by the sulfur smell seeping out of the volcano. After being up for so long I slept well through the night and met Justine and Barry for breakfast at the pool. After two cups of very strong, and very good, cappuccino, a hot chocolate croissant and some bread spread with Nutella, we decided to go on a hike up the volcano. It only took us about 45 minutes to reach the rim, but it was a somewhat difficult climb with steep terrain and sizzling hot air. 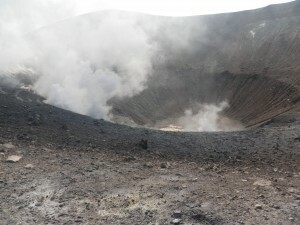 We circled about half of the rim (the rest had very thick, sulfurous smoke covering the path). Our excitement quickly grew as we stared across the Mediterranean Sea, picking out beaches and tunnels that we were eager to explore. After hiking down the smoking volcano, and a wonderful lunch in a cafe, Justine, Barry and I decided to paddle around the island. It was already 3 p.m. and the sun sets at around 7, so we figured we had tons of time to do a slow, leisurely, playful paddle around the island, which we estimated was about 10 nautical miles. As we paddled the wind picked up a bit. It wasn’t bad, but it was certainly slowing our progress. We played in the rocks as we circled the island, stopping frequently to take pictures. I did a roll and was surprised by how salty the water tasted. I was also surprised by the dark blue color that the water possessed and the warm, bubbly spots where hot lava boiled far below. Justine was paddling past a small cave-like feature and called Barry and I over, commenting on the steam and the warmth that was coming from the small alcove. 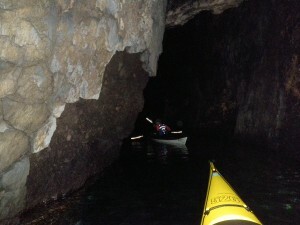 Her and I both hopped out of our kayaks into the warm water and swam over to the natural hot spring, set in the cave. Barry jumped out as well and was very considerate in securing the three drifting kayaks with a rope to the rocks. Each of us took a turn sitting in “the hot spot.” When I was sitting there I could smell the sulfur, although I wasn’t too bothered by it until I suddenly felt like I didn’t have enough oxygen, got lightheaded and a little panicked. I didn’t say anything because I couldn’t decide if it was my imagination or not, but when Barry sat there he jumped up and said, “I can’t breathe, and I’m dizzy.” I confessed that I’d had the same problem and we all got out of the cave, cowboy jumping back into our kayaks. We continued to go around the island even after a lighting storm started. The lightning continued, increasing steadily until we had flashes every few seconds. 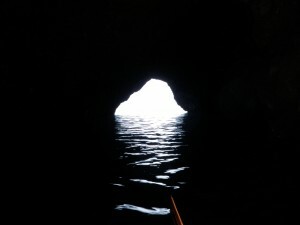 Then we came to a sea cave. Each of us moved through a large archway, making a sharp left turn into a cavern that was mysteriously lit up by blue light. It was amazing. We slowly made our way out of the cave, lingering a bit in the magical glow. We went around the lighthouse at the end of the island, still watching the lightning as the sun started to set. Justine had been monitoring our distance, and we soon realized that the 10 nautical mile prediction was far from accurate. After a little while we came to a second sea cave. Justine made her way in first, pausing to make sure that there really was light at the end… signaling an exit. She thought she saw something and began her descent into the cave. I followed with Barry close behind me. I couldn’t really see Justine, but I thought I could slightly make out the outline of her head… although in the pitch black of the tunnel it might have been my eyes playing tricks on me. 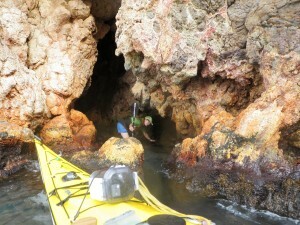 A couple of times I heard the sickening crunch of a kayak scraping against a wall. About 1/4 of the way through the tunnel, although we didn’t know the length at the time, there was an opening to the left. “An emergency exit,” as we had heard it referred to back at the camp. We didn’t take this exit and continued our way through, occasionally startled by jumping fish. At one point I had my paddle across my lap and was using my hands to take a picture. My paddle suddenly became jammed on each side of the wall and I was brought to a halt. It took some pressure to release the paddle from the walls on either side of me. When we came out of the tunnel we picked up the pace a little. The sun was going down, the wind had picked up and the lightening strikes were becoming more and more frequent. I think that all of us were getting a little concerned as it got darker and we could barely make out the cliffs. None of us had a light, and after each volcanic headland we expected to see the campsite but didn’t, and quickly moved onto the next headland, wondering if the campsite was around that corner. The lightening meanwhile was coming every 5 seconds or so, and Barry both jokingly and nervously commented that he was going to fight me for my Greenland stick, since he wasn’t so enthusiastic about holding a carbon fiber paddle in the storm. Finally the campsite came into sight. When we pulled up onto shore it began to rain. It was some of the strongest rain I have ever been in. Justine’s GPS was reading 14 1/2 land miles. We drove back to the hotel in the rain and hail and quickly dropped off our wet gear before heading into town for dinner. When we walked into the restaurant we were greeted by a table of kayakers. They were part of the symposium and invited us to join them. During the meal I tried many interesting and wonderful foods… a pasta dish, octopus… which I loved, a fish that was brought to the table whole before it was cut and served. We ate the fish, and I even tasted the brain, which wasn’t horrible, although I’ll admit that it was difficult to get over the fact that it was brain. There was a tomato salad, lots of bread and something that was called white pizza, a kind of bread with seasoning and parmesan cheese, but no sauce. I also tried a biscotti dipped in liquor. After that we headed back to the hotel, where I was very glad to see my bed. The following day the symposium would begin. As I write this I find myself chuckling. A year ago if someone would have told me that I’d be writing a blog, I wouldn’t have believed it. I figured that if I started one then I would have to maintain it. But I’ve given in. I write in a journal regularly anyway, so I’ve decided to share some of my kayaking adventures with anyone that wants to read about them. I am not planning on going back in time and writing about the past, although I will say that each place that I have kayaked holds its own unique magic. 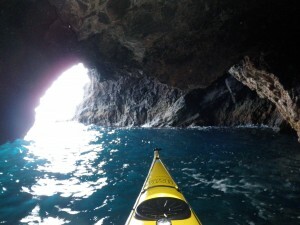 Two weeks ago I returned home from The Vulcanoa Marathon Sea Kayak Symposium in Italy, where I taught rolling, performed a rolling demonstration, presented on my experiences at the 2008 Greenland National Kayaking Championship and did a kayaking tour of the Aeolian Islands, a group of volcanic islands off the coast of Sicily, Italy. In the next day I’ll be writing about my experiences there. On Monday I got back from San Simeon, California, where I instructed at TAKS (Traditional Arctic Kayak Symposium), which I also intend to write about. After that the “kayaking season” is pretty much over for the year, which means that “my season” begins. This is the time of year when the Pacific Ocean transforms into its winter state, often with strong winds, swells exceeding fifteen feet and wind waves to dance and play in. Unlike most of the west coast, I live in a place where there is usually enough protection from the incoming swell to be able to launch “relatively easily,” even if the ocean is in one of her winter moods. Humboldt County, California is my home, and there are a group of friends that I meet every Sunday morning; rain or shine, flat or ferocious, and we go out and play in the magical waters of Trinidad and surrounding areas. Whenever I kayak in a new place I collect a small amount of the water that I kayak in. More often than not, it’s collected in a plastic water bottle that I find lying on the beach and I quickly scribble the place and the date on the bottle, trying to get a pen to work on the damp plastic. When I get home, I pour the water into a more attractive container and label it clearly, placing it on a shelf behind glass. This water collection has grown significantly over the past year, and I expect it to grow even more in the coming months. Join the Kayak Academy for traditional Greenland-style kayaking lessons, demonstrations, competitions and social activities during the annual Greenland Week. Spectators are welcome, park admission is free, and the competition and demos are open to the public to watch. The park’s food concession will be open throughout the weekend. Description: SSTIKS is a family friendly weekend event. Beginners to advanced paddlers and rollers find new challenges and build new skills each year. A fun, community-minded, BCU skill-based sea kayak symposium hosted by Columbia River Kayaking and Slow Boat Farm in Wahkiakum County, Washington. On Saturday, Oct. 31 Helen will be teaching a semi-private rolling clinic. Although the focus of the class is on Greenland style rolling, anyone is welcome to attend. The class will take place at Big Lagoon and will consist of three students and last two to three hours. She’ll be teaching whatever people want to learn (first rolls, off-side rolls, layback rolls, forward finish rolls, norsaq rolls, hand rolls… whatever). Pre-registration is required. To register, contact Helen at helen@greenlandorbust.org.